All summer. My wife Rene’ and I spent all summer with President Josiah “Jed” Bartlet and his constantly evolving staff. 154 episodes spanning the years 1999-2006. A popular culture time capsule of American political thought as seen from the left of center. From the opening sequences of the pilot, where the POTUS (President of the United States) slams into a tree riding a bicycle, to the ending show, when another man is sworn in to replace Jed in the White House, this was and is one amazing television series. Watching it serially, without commercial interruption, is a rich viewing experience, a reminder of just how good some of our best network television can be. Martin Sheen, who played former New Hampshire Governor and President Bartlet. Other actors you might recognize who had major roles over the course of the series include Stockard Channing, Alan Alda, Jimmy Smits, Richard Schiff, Dule’ Hill, Mark Harmon, John Amos, and Rob Lowe. 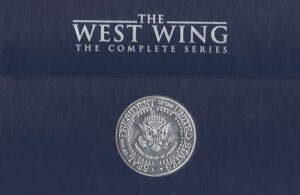 From top to bottom, the acting, directing, and screenwriting of virtually every episode of this titanic effort, led by screenwriters including Aaron Sorkin, Lawrence O’Donnell and Bradley Whitford, with technical assistance from former Clinton staffer Dee Dee Myers, is very simply the best you will see in a network series. Regardless of your political affiliation, the players in this series, from the every day household staff to the folks who play the secret service agents, bring it home every episode, whether the topic is domestic or international. The President’s failure to disclose his MS. A near assassination attempt. Terrorist acts, foreign and domestic. They are all intricate panels in the tapestry of a fictional presidency brought to life against the backdrop of Islamist Jihad and 9/11. Sheen simply is the president: no other actor could have played the part with such grace, nuance, style, and honesty. He is the core of the troupe and sets an example of excellence which compels those around him to elevate their games. The candidacy of Democratic Congressman Matt Santos for the presidency takes up a good deal of the last two years of the series. Santos, played by Jimmy Smits (of NYPD Blue fame), is a forty-something Hispanic father, husband, and FDR Liberal from Texas. His electoral foe is Arnold Vinick, a middle-of-the road, pro-choice Republican battling not only Santos but the right wing of his own party. Played admirably by Alan Alda, the aging, weary Vinick seems a not-so-subtle symbol for the present-day GOP. In a splendidly realistic turn, Smits and Alda were asked to do an entire hour show live, as if their debate before a national television audience was the real deal. It is one of the highlights of the seven seasons of the show. To see two great actors go toe to toe in front a live audience in one take, well, that’s simply a remarkable piece of film that should be studied by television directors and actors for years to come. Rene’ and I were saddened when our time with the Bartlets and the other characters in this fine dramatic series came to an end. Given the atmosphere in our politics and the trend to air quality dramatic shows on cable channels, it’s doubtful anything like West Wing will ever air on commercial television again. * The McGarry character suffered a heart attack during season six and that’s what prompted the Cregg character to be elevated to Chief of Staff. In real life, actor John Spencer had a fatal heart attack during the show’s final season, life mimicking art in a tragic way. The nature of how the series dealt with the passing of Leo McGarry was both nuanced and caring, displaying the obvious love the other actors had for their fallen comrade. If you want to see Spencer at his best on the big screen, check out his role in Presumed Innocent with Harrison Ford.